Nowali Cable Knit Moccasin are adorable, cozy, and actually stay on little one’s feet! If you have a toddler, you’ve probably experienced what usually happens with slippers designed for little ones…they always slip off! Not with Nowali, which are made in Sweden and are great on any floor surface. Our feature product is our famous Swedish moccasin. This item is a unique combination of a sock and a shoe: knit sock upper with a leather sole and color coordinated foxing. The moccasins are still stitched together by hand in the traditional Swedish way. 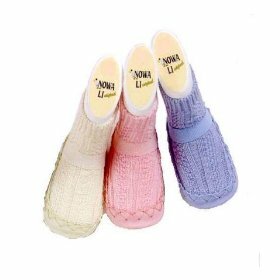 These slipper socks are “are certified to comply with the Öko-Tex Standard 100, an ‘eco’ standard which ensures they contain no harmful dyes or substances” and is a winner of The New Parents Guide Seal of Approval. They are made of 80% cotton and 20% polyamide. Of course, these moccasins would be more eco-friendly if made from organic cotton. Nowali has been making moccasins for over 50 years!